Farmer herds his three bulls in Nikhekhu Village, Dimapur, Nagaland, India (photo credit: ILRI/Stevie Mann). 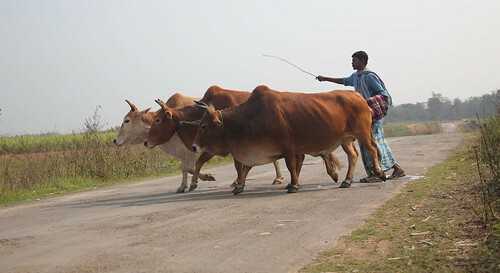 Rapid urbanization in India has led to expansion of peri-urban fringes, where intensive, industry-style livestock rearing has led to emerging vulnerabilities at the human-animal-environment interface. To better understand the health system and farm-level factors that influence the risk of transmission of bovine tuberculosis in animals and humans, a qualitative study was undertaken among smallholder dairy farms in peri-urban zones in three cities in India: Guwahati, Ludhiana and Bangalore. Data were collected through literature reviews, expert consultations and in-depth interviews. The study, published in BMC Public Health (March 2019), found that farmers consulted veterinarians as a last resort after home remedies and quacks had failed. Damage control measures, especially with respect to selling or abandoning sick animals, added to the risk of disease transmission. Although civic authorities believed in the adequacy of a functioning laboratory network, end users were aggrieved at the lack of services. Despite the presence of extension services, knowledge and awareness were limited, promoting risky behaviour. In addition, the absence of policies on the management of bovine tuberculosis may have influenced stakeholders not to consider it to be a major animal and public health concern. “Evidence is needed not only about the burden and risks, but also on possible options for control applied in the local Indian setting,” the authors say. The study also recommends that the identified gaps in knowledge be addressed through collaborative research and One Health interventions involving both animal and human health sectors. Access the article Community, system and policy level drivers of bovine tuberculosis in smallholder periurban dairy farms in India: A qualitative enquiry by A.S. Chauhan and others. Sheep market in Doyogena, Ethiopia (photo credit: ILRI/Zerihun Sewunet). 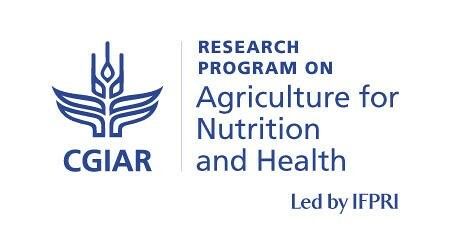 The hub, launched on 21–22 February 2019, in Nairobi, Kenya, will be led and hosted by the International Livestock Research Institute (ILRI). Antibiotics and other antimicrobial drugs are among the most important tools available to medical and veterinary professionals for curing human and animal diseases and improving their welfare, yet these drugs are increasingly failing. Development of resistance to these drugs in disease-causing bacteria and other microbes poses a major threat to global development; the World Bank estimates that annual global gross domestic product could fall by more than 1 trillion United States dollars (USD) by 2030 because of it. While the World Bank also estimates that investments of USD 6 to 8 billion annually could mitigate this loss, at present, it seems the antimicrobial resistance problem will get rapidly worse before it gets better. Large quantities of antimicrobial drugs are used to cure human illness and provide healthy livestock and fish for food. Though specifics are unknown, use of antimicrobials for livestock and in aquaculture, is rising, particularly in low- and middle-income countries. These antimicrobials are often used in suboptimal ways, such as applying dosages too little to be effective or over too long a time period to be environmentally healthy, or the wrong drugs are used, or antibiotics are used for diseases not caused by bacteria. Humans, livestock and fish excrete these drugs, which leads to environmental contamination, including that of water systems. Globally, the main driver of the growing incidence of antimicrobial resistance in humans is overuse and misuse of antibiotics in human medicine, which applies selective pressure for resistant pathogens. But antimicrobial use in agriculture to control animal and plant diseases also contributes to this growing drug resistance problem, although experts don’t know the contribution of agriculture to the problem in humans. The greatest challenges and burdens of antimicrobial resistance will be felt by the poorest in poorer countries. While these countries with their rapidly growing populations face the greatest and rising demand for increased food production, their populations also tend to have poorer access to relevant knowledge, veterinary and health services. The countries face challenges in enforcing regulations and understanding and implementing effective antimicrobial resistance surveillance. With its mandate to improve the livelihoods of poor people, improve food and nutrition security and improve natural resource management through agriculture and food research, CGIAR is ideally positioned to tackle agriculture-related antimicrobial risks in developing countries and to develop, test and promote solutions to mitigate these risks together with its partners. Like climate change and malnutrition, two other global challenges CGIAR works to address, antimicrobial resistance challenges us to use evidence and find ways to change the knowledge, attitudes and behaviors of people. Any solutions will require combining technical, institutional and policy innovations and leveraging the contributions of different sectors and disciplines, and both public and private actors. The new CGIAR Antimicrobial Resistance Hub will work to foster learning from past experiences, support research excellence in the global south and ensure a critical mass of coordinated research to find suitable and sustainable solutions. ILRI will be joined in this effort by three CGIAR research programs—Agriculture for Nutrition and Health, FISH and LIVESTOCK—along with three CGIAR centers—the International Food Policy Research Institute, the International Water Management Institute and WorldFish. Together, these seven research programs and institutions with their national partners and partner research organizations outside CGIAR, will support global research efforts among experts the world over—from low- to middle- to high-income countries. For more information about the CGIAR Antimicrobial Resistance Hub, contact Barbara Wieland at b.wieland@cgiar.org or Delia Grace Randolph at d.randolph@cgiar.org. Donor investment in food safety in sub-Saharan Africa should have greater focus on the needs of consumers in Africa, according to a new report by the Global Food Safety Partnership. The report, Food safety in Africa: Past endeavors and future directions, analysed donor investment in over 500 food safety projects undertaken in sub-Saharan Africa since 2010. It found that more than half of these projects were focused on overseas markets and less than half on consumers in sub-Saharan Africa, most of whom rely on informal food markets and bear the greatest health burden of unsafe food. According to estimates from the World Health Organization, foodborne disease in Africa results in 137,000 deaths and 91 million cases of illness a year. Globally, foodborne disease has a public health burden similar to HIV/AIDS, malaria and tuberculosis. Better address the health of domestic consumers dependent on informal markets. Governments and international donors should put citizen health at the heart of national food safety systems, establishing health-based goals, priorities, metrics and strategies and helping to generate the missing evidence needed for rational planning. 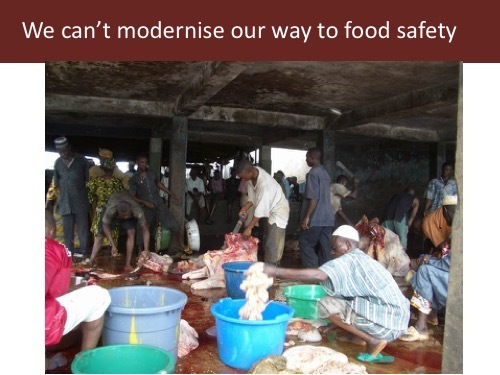 Build capacity for well-governed, evidence- and risk-based food safety systems. The donor community and national governments should endorse principles of science- and risk-based prevention, adapted to local conditions. Harness today’s marketplace drivers of progress on food safety. Donors and national governments should support the consumer and marketplace drivers of progress on food safety through well-informed and empowered consumers, able to demand food safety, and a private sector that has capacity and accountability to respond to consumer demand. Cattle going to the grazing field in Afar region, Ethiopia (photo credit: ILRI/Apollo Habtamu). 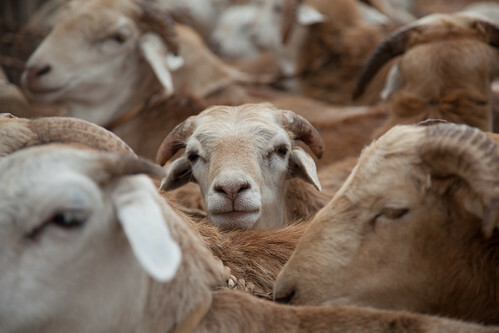 Climate change influences the occurrence and transmission of a wide range of livestock diseases through multiple pathways. Diseases caused by pathogens that spent part of their life cycle outside the host (for instance, in vectors or the environment) are more sensitive in this regard, compared to those caused by obligate pathogens. A newly published book, The Climate-Smart Agriculture Papers, brings together some of the latest research by agricultural scientists on climate-smart agriculture in eastern and southern Africa. The 25 chapters of the book highlight ongoing efforts to better characterize climate risks, develop and disseminate climate-smart varieties and farm management practices, and integrate these technologies into well-functioning value chains. 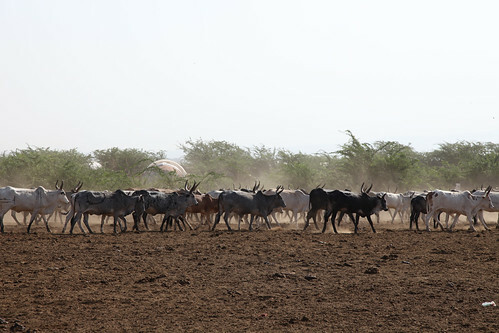 In a chapter on climate change and livestock diseases, scientists from the International Livestock Research Institute (ILRI) use two well-studied vector-borne diseases—Rift Valley fever and tick-borne diseases—as case studies to describe direct pathways through which climate change influences infectious disease-risk in East and southern Africa. Access the chapter, Climate change and infectious livestock diseases: The case of Rift Valley fever and tick-borne diseases by Bernard Bett, Johanna Lindahl and Delia Grace. The Lancet Countdown: tracking progress on health and climate change is a multidisciplinary, international research collaboration that provides a global overview of the relationship between public health and climate change. Publishing its findings annually in The Lancet, the initiative generates research evidence to inform an accelerated policy response to climate change. The Lancet Countdown 2018 report presents the work from leading academics and technical experts from 27 partner academic and United Nations institutions around the world, including the International Livestock Research Institute (ILRI), Tehran University of Medical Sciences, University of Sydney and the World Health Organization. The study was funded by the Wellcome Trust. Among the report’s co-authors are Delia Grace, veterinary epidemiologist and co-leader of the Animal and Human Health program at ILRI, and Paula Dominguez-Salas, assistant professor in nutrition-sensitive agriculture at the London School of Hygiene and Tropical Medicine on joint appointment at ILRI. Present day changes in heat waves, labour capacity, vector-borne disease and food security provide early warnings of the compounded impacts on public health that are expected if temperatures continue to rise. Trends in climate change impacts, exposures and vulnerabilities show an unacceptably high level of risk for the current and future health of populations across the world. A lack of progress in reducing emissions and building adaptive capacity threatens human lives and the viability of the national health systems they depend on, with the potential to disrupt core public health infrastructure and overwhelm health services. A number of sectors have seen the beginning of a low-carbon transition; the nature and scale of the response to climate change will shape the health of nations for centuries to come. The full text of the Lancet Countdown 2018 report is available for free via The Lancet website (you will need to create a free account with The Lancet). Johanna Lindahl, senior scientist at the International Livestock Research Institute (photo credit: ILRI/Dinesh). 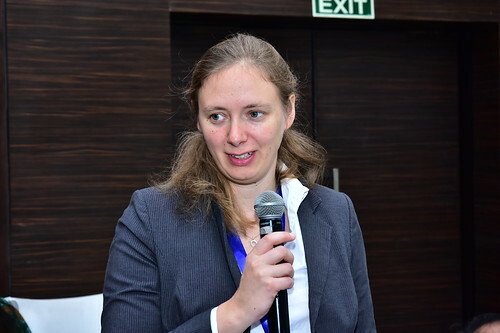 We congratulate Johanna Lindahl, a senior veterinary epidemiologist at the International Livestock Research Institute (ILRI), on receiving the 2018 Swedish Institute for Global Health Transformation (SIGHT) Award and SEK 100,000 in recognition of her excellent scientific contribution to global health. The award was presented at a ceremony held in Stockholm on 25 November 2018. The decision on the recipient of the SIGHT Award 2018 was taken by the board of the Royal Swedish Academy of Sciences. Lindahl is also an associate professor at the Swedish University of Agricultural Sciences and Uppsala University.